Did a little Bible Study this morning. I wanted to share with you. No matter how hectic it gets or how tired you get you have to hold onto HOPE!! 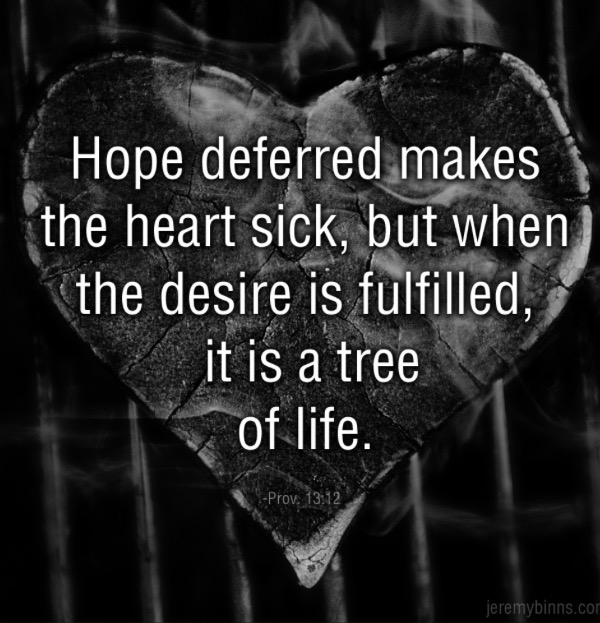 Proverbs 13:12 Hope deferred makes the heart sick,but a desire fulfilled is a tree of life. Watch what Faith can do!! This entry was posted in Uncategorized and tagged Faith, God, Hope, Inspirational. Bookmark the permalink. I remember that scripture, which was the mantra for my friend who became a Christian at 18 but didn’t get married until 38. Her hope in God was richly rewarded because he is an amazing, godly man and they know have 2 kids together.